This time of year is all accessory knitting for me! My needles are clicking, I am finishing hats and Christmas sweaters, and the blocking boards are full of gifts waiting to be wrapped. 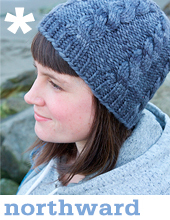 So how about a simple toque to get you through? Easy Peasy! As you may have noticed, this year Emily and I have been taking a new look at some of our old favorites and the Easy Peasy was definitely one of mine. So simple and satisfying! I’ve combined 2 of my older patterns, the Easy Peasy and the Ear Flap Cap and put them together. 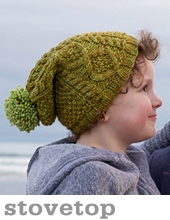 The pattern now includes options with or without earflaps and comes sized for the whole family. If you already have the pattern you will receive an update with the new version. I am a big hat knitter at this time of year. I think they make a great gift, they are a great way to stash bust (just one skein will usually do it! ), and did I mention they are pretty quick? How about you? 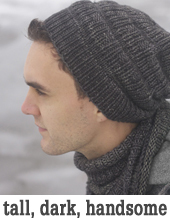 What are your favorite gift knits? Hi Kathleen – once you finish the second ear flap you will knit across those sts, cast on the number of sts for your size, then knit across the second earflap, cast on the number of sts for your size. When working across the second earflap with your working yarn you want to make sure the garter st is maintained, so you have the RS of the work facing you. love the earflap version, what a great idea to combine a couple of your previous patterns- good thinking, with such adorable results! I’m also making a ton of hats for Christmas plus a few cowls :) This is super cute! I’m doing hats for the boys and chunky scarves for the girls — both are super quick and simple, and great for the people on my list I never know how to shop for. Plus, easy to stash a couple extra in my bag for the unexpected run-ins that require some sort of gift — kid’s teachers, co-workers, or the old lady down the street.